The 1970 Big Red Special Mustang was a limited edition Mustang sold in Nebraska and featured Nebraska Scarlet Red exterior paint. Both hardtop and fastback models were available. 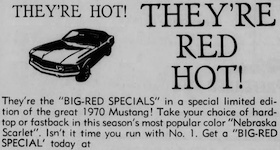 This is an advertisement we found for the 1970 Big-Red Special Mustang which featured a special "Nebraska Scarlet exterior color in hardtop or fastback body styles. We found this ad in the Lincoln Sunday Journal and Star of November 2nd, 1969. It reads, They're Hot! They're Red Hot! They're the "BIG-RED SPECIALS" in a special limited edition of the great 1970 Mustang! Take your choice of hardtop or fastback in this season's most popular color "Nebraska Scarlet". Isn't it time you run with No. 1. Get a "BIG-RED SPECIAL today at O'Shea-Rogers Ford, but hurry!